Shopclues Independence Day Offers bring 3 lac + products at lowest prices. 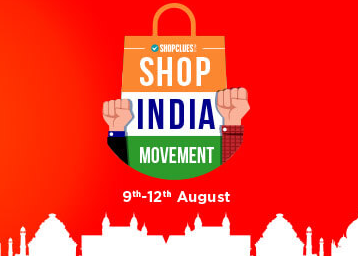 Shopclues Independence sale kick starts on August 9. Get best deals across categories fashion, accessories, home & kitchen and more. Get ready for more shopping fun. Shopclues Independence day sale is here. Shop across categories like fashion, accessories, home & kitchen appliances, electronics and more. Get extra cashback on your purchase with Mobikwik, Airtel Money, and Freecharge. Invite your friends to Shopclues Sale to earn Free 200 CluesBucks+. Get free shipping with no minimum purchase on Shopclues app. Shopclues is ready with its independence day sale 2018. The deals start from as low as Rs 72. So get ready for a super affordable shopping experience. Don't miss on the chance as the products run out of stock very fast. Shopclues is popular for its money-saving deals, this time again the online marketplace is back with some jaw-dropping offers. The deal starts from as low as Rs 72. So get ready for a super affordable shopping experience. Don't miss on the chance to shop some really cool and useful stuff at throwaway prices. Independence Day Online Offers of e-commerce stores have started to roll out with mega discounts across categories. Or Download the mobile app. Note: Get extra Rs 40 OFF on prepaid orders Above Rs 149 by using Shoplcues Coupon Code "PREPAID40" on your order. Apart from the mega discount offers of Shopclues sale, you also get to save more with cashback offers. Get cashback on payment with Airtel Money, Mobikwik, and Freecharge. Maximum Cashback with Airtel Money is Rs 100. You get up to Rs 75 cashback with Freecharge. Similarly, Mobikwik users get 15% supercash up to Rs 200. In addition, Shopclues is offering 10% off on all prepaid orders in its independence day sale. There is no minimum order value to avail the cashback offer. Buy refurbished feature and smartphones at best prices online. Shopclues Independence day offers bring discounts on best selling refurbished phones. These mobiles also come with Shopclues surety. Buying refurbished phones is a very budget friendly option to upgrade to your favorite phone. You don’t have to worry about the budget as these devices are priced very less than the new ones. The deal gets better with Shopclues offering minimum 40% off on branded refurbished mobiles. Get the best selling products across categories like fashion, accessories, footwear and more. All these get mega price cuts with Shopclues Freedom Sale. The online marketplace is offering best discounts on best selling products across all categories. No need to go through endless pages to find discounts you get them at one place with Shopclues freedom sale. These are the most trending accessories. Get your first smartwatch with Shopclues sale at up to 90% OFF. You ge many choices for every budget. Pick any one that fits your budget and requirement. There are some really affordable ones and also many branded smartwatches so you have option to shop as your budget. These smartphones come with many advanced features and the prices are simply unbelievable. It is festive season, shopping for new clothes is something you simply can’t miss. Shopclues offers minimum 60 percent off on women’s clothing. Shop your heart out for your new festive look without worrying about budget. Buy everything from embroidered sarees, to salwar suits to leggings at discount price with Shopclues Independence Day Sale. You can shop for the upcoming independence day and Raksha Bandhan. App only bachat of Shopclues Sale brings many exclusive offers on your mobile. To avail these offers download and install Shopclues app on your mobile. App bachat is one of the major attractions as you get to save more by shopping from Shopclues mobile app. There is also free shipping on all orders placed from app during the sale period. Find the best bargains on designer sarees, headphones, footwear, and mobile accessories at one place. During the independence day sale 12 - 6 PM time slot is reserved for special deals. You get some unbelievable price drops across popular product categories. You can not simply afford to miss the deals march as the price drops are so big. Whether you are looking to buy clothing, footwear, or accessories check the deals during this time slot to find some really amazing bargains. Find the best of deals on the widest collection of home and kitchen products with Shopclues. You can shop home interiors, designer clocks, and bathroom accessories at the best prices online. Kitchen and dining range starts only Rs 99 with Shopclues Sale. You get 1 lac+ home & kitchen essential at bargain price. This means you have the best of products at the best of prices. Shopclues is also offering coupon codes which customers can redeem on their purchase during the freedom sale. There is free shipping coupon code “FREEDOM” applicable on purchase from Shopclues App. Customers get extra Rs 40 discount on prepaid orders with coupon code “PREPAID40”. This coupon is applicable on minimum purchase of Rs 149. For your order value of Rs 500 and above use code "JWMIN500" for 10% extra off. You can also invite you friends/family to Shopclues sale. You get up to Rs 500 for every referral. Share your unique referral link via SMS, Email, or Whatsapp. To participate download shopclues app and get you referral code. You have to share the link with friends. You earn for every person who register via Shopclues app. Note: Each ClueBucks = Rs 1. You can pay 10% of you order via ClueBucks. If you shop for Rs 1000, use 100 CluesBucks and Pay remaining Rs 900 via any mode of payment. It means you save Rs 100. Shopclues freedom Sale is live with maha bachat offers of the season. The sale will run until 12 August bringing mega price drops across categories. Shopclues makes online shopping more affordable with great value for money products. And it gets better with independence day offers. Get up to 80% off on categories like fashion, mobile accessories, lifestyle, and more. Many app exclusive offers are also available which make online shopping more rewarding.